Hi! Thanks to everyone who played in our challenge last week! 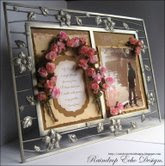 There were many fabulous creations and we are so happy to see some of you are interested in joining our design team!! If you would like to join us as part of our design team, please read the previous post for more details and enter our challenges from now until the end of July adding DTC to your link, so we can see your creations! We will be announcing the new team members at the beginning of August!! 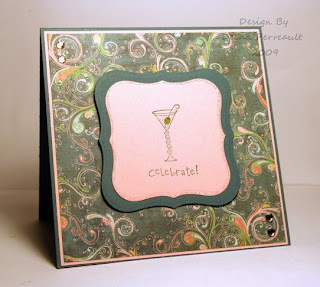 On to this week's CHALLENGE: CELEBRATIONS Put on your party hats and show us how you celebrate!! There are lots of festivities going on around this time of year, but it doesn't have to be the obvious ones!! There are many things to celebrate, so lets partaaay!! We have a fabulous sponsor this week too!! 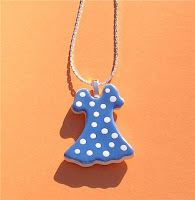 SASSY BELLE WARES is coming to our party wearing this cute blue polka dot dress!! This fab and fun necklace might be yours by the end of the week! Have a look at her shop on ETSY for more of her whimsical creations, jewelry, bookmarks, magnets and more! And I (Deena) served up the drinks for this Sparkly Celebration! We are so looking forward to having you celebrate with us!! 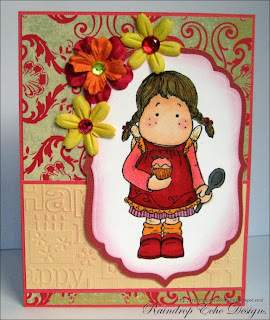 Check out the great card Ann made! It's perfect for those celebrating Independence Day this weekend. Ann, please drop me a line at alimanning@charter.net with your mailing address and I will send it right out to you. 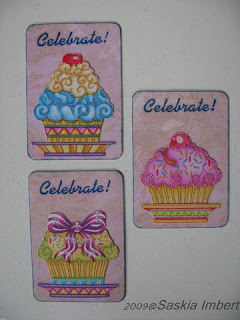 Don't forget to check this week's challenge - Celebrations! Scroll down for this weeks Challenge. 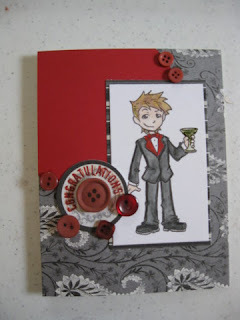 . .
Congrats to http://lilacanglia.blogspot.com/2009/06/grandad-fathers-day-card.html on winning the random drawn prize. Please email me your snail mail, johnandjaime@clearwire.net , and I will get your prize in the post. Now for the DT call. . .
We are sad to say that Miss Steph has had to step down from the DT. We wish her much luck in her future endevors and hope that one day she will be able to join us again on the DT. We need to extend many thanks to her for all that she has done in getting this Challenge blog going. THANKS STEPH, You are MISSED! So we are looking to fill 2 DT positions, as we have decided to add another as well. From now till July 21, the call is open. We ask that you comment here and link to your blog, so we can have a look see, also if you want to place a DTC behind your name in linky for the challenges between now and then. We will announce the 2 new DT members the first week of August. Remember to enter the Stars and Stripes Challenge below. As July 4 fast approaches in the USA, I chose Stars and Stripes as our challenge theme this week. 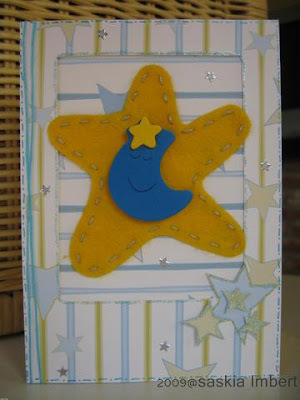 Your project can include any kind of star or stripe, it doesn't have to include both and doesn't have to be a patriotic project. Just have fun! 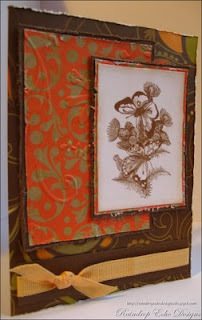 I'm giving away the prize this week and it's a brand new acrylic stamp set by My Favorite Things called Funky Flowers. 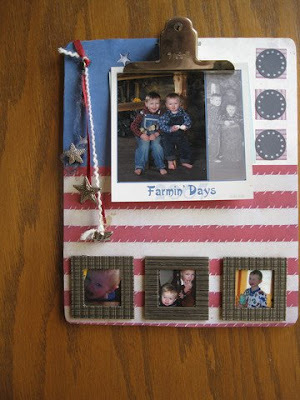 Jaime made a fabulous altered clipboard showcasing her cute boys. 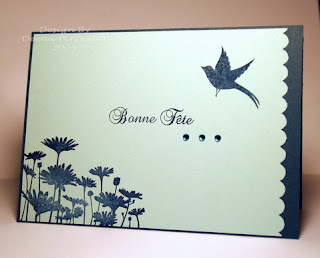 Deena used a beautiful birthday stamp on her card. 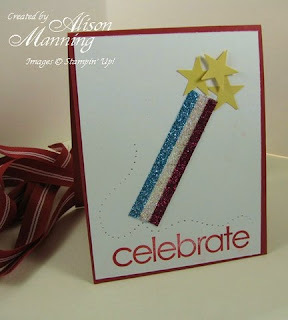 And I (Ali) chose a July 4 theme with this red, white and blue card. 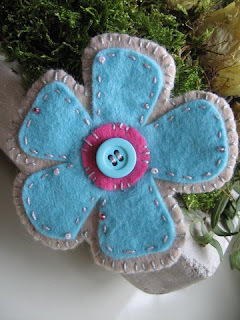 Any crafty creation is accepted and you have until Tuesday June 30 at midnight to post and leave us a link using the Mister Linky Form below, to be entered into our random pick for this week's prize. If Mister Linky isn't working, please leave your link in the comments section. We can't wait to see what you create - happy crafting! Challenge # 20-- How does your garden grow? It is once again my turn to set the challenge this week and all I have been doing lately is planning, planting, and weeding in the garden. So what a better challenge than to see how your garden grows. This can range from what you would find in it, tools, scene, or anything garden. I am sponsoring this week with some products from CTMH. 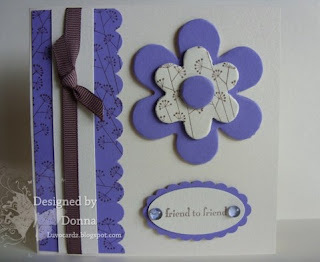 The stamp set is the current stamp of the month- Tender Tags. 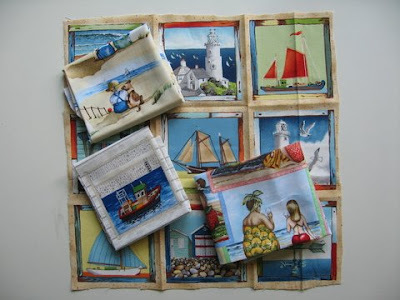 The papers is a sampling 6x6 assortment of their current sets. Ann from Rain Drop Echo has done a lovely job again. Make sure to check out her blog for all of her lovely work. Congratulations Christine! Please send an email to alimanning@charter.net and I will send you your prize. 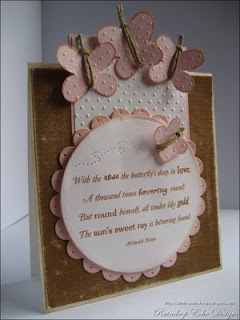 Welcome to Crafty Creations Challenge blog! 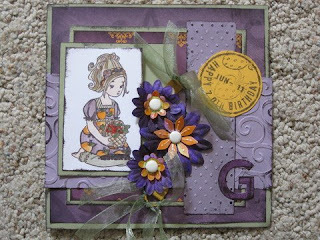 We have a color challenge for you this week - incorporate the color purple into your crafty creation. 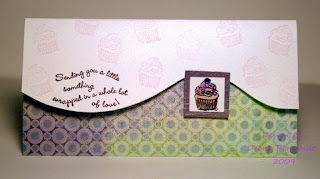 This week's prize is a stamp set from Stampin' Up! 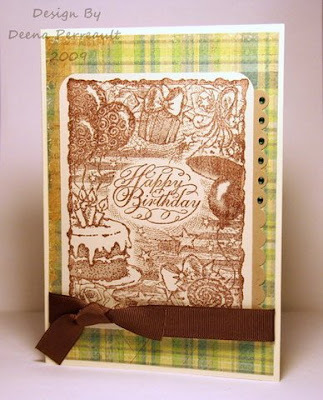 called Birthday Whimsy plus 6 yards of Stampin' Up! 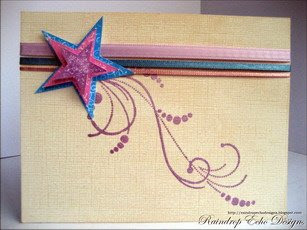 's new Polka Dot In Colors ribbon. Any crafty creation is accepted and you have until Tuesday June 16 at midnight to post and leave us a link using the Mister Linky Form below, to be entered into our random pick for this week's prize. If Mister Linky isn't working, please leave your link in the comments section. WINNER 'Sand and Sea' Challenge ! Please drop an email with your address to saskia.imbert@telenet.be. Have fun with this week's PURPLE challenge everyone! Welcome our new Guest Designer!! We have an exciting announcement to make!!! 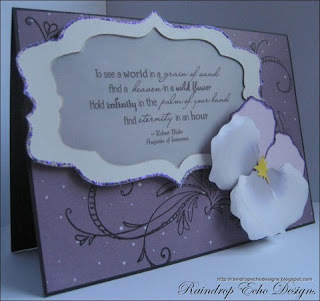 We have chosen our Guest Designer from last weeks entries!! 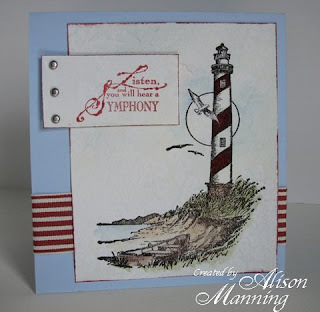 Please welcome Ann of RAINDROP ECHO DESIGNS!! Thank you Ann! We look forward to having you with us for the next two weeks!! Thanks to all of you who showed your interest in joining our Guest Design Team, please continue to enjoy our challenges! You are what makes this challenge blog exciting and fun for all of us!! Come back this Wednesday and show us your fabulous creations so we can choose another guest designer to join our team for a two week term! Thanks to all of you who participated in last week's butterflies challenge ! Deena will announce our Guest Designer for the next 2 weeks on friday! 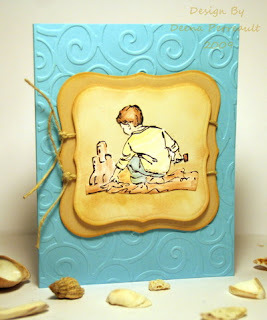 Now it's time for another Crafty Creations Challenge! is offering up these 4 pieces of fabric for our lucky winner! 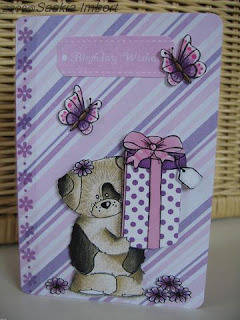 Have a look at her shop for more lovely fabrics, cards, decoupage papers, etc. The website is in Dutch, but it's no problem to send Ingrid a message in English for any information or order. She's shipping worldwide! Thanks to everyone who participated in last week's butterfly challenge! We so enjoyed looking at every one of your creations!! Also a big THANK YOU to our sponsor, SHOOTING STAR JEWELRY for the fabulous prize!! 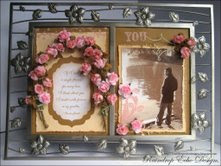 I will be back on Friday with a winner for the GUEST DESIGN SPOT. We need a couple of days to have a good look at all your submissions again before deciding! I can tell you it will be very difficult to choose just one of you!! However, we will be asking for new submissions with Challenge #19 so come back and try again if you were not chosen this time round! We will choose a new GUEST DESIGNER every other week!! CONGRATULATIONS!! Ashley, just send us an e-mail at deenaperreault@hotmail.com with your address info and our lovely sponsor, SHOOTING STAR JEWELRY will send you your prize! 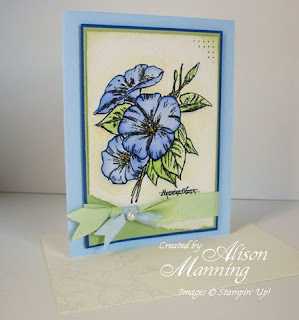 You can see Ashley's lovely card on her blog!